The Istari - Apparently the Valar made the decision never again to intervene directly in the affairs of Middle Earth in the Third Age as they had in the First when they defeated Morgoth (either that or they had become too lazy). Instead they sent five servants known as the Istari to aid the free peoples of Middle Earth against the threat of Sauron. 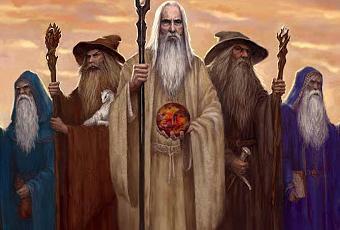 They were on the order of Maiar, but Men called them the Wizards. The other two Wizards are not mentioned by name, but the Unfinished Tales lists them as Alatar and Pallando, and they were known as the Blue Wizards (because their robes were blue). After arriving in Middle Earth they apparently traveled far into the east never to return, and so played no part in the War of the Ring.